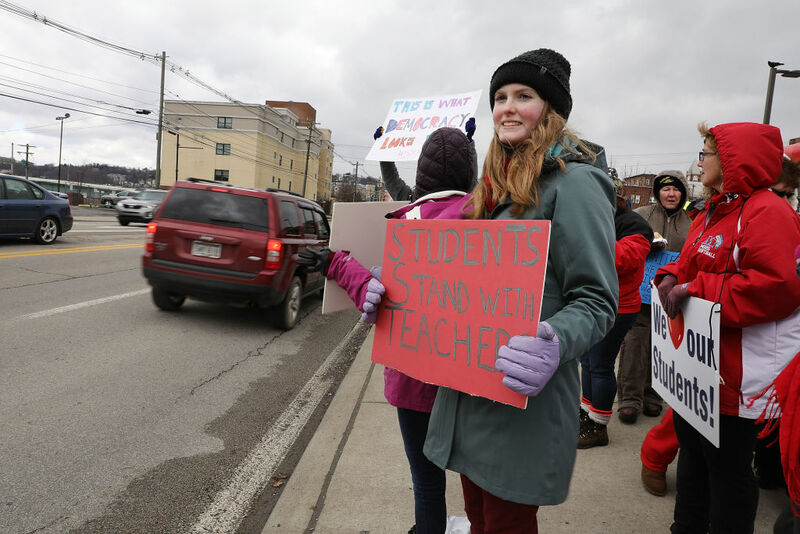 An update from West Virginia, where it's virtually certain the strike will continue on Monday. For the first time, the capitol protest today took place on a weekend. About a thousand people were here in the morning, though it thinned out by the afternoon. Momentum remains overwhelmingly with the strikers. Everybody really wants to go back to work, but they are determined to only return once their demands are met. Morale remains high. The general perception among the public at large is (correctly) that a small group of recalcitrant Republicans is now responsible for blocking the return of West Virginia’s children to school. There is a deep crisis in the state leadership. The strike’s demand at this point is for the legislature to pass the proposed 5 percent pay increase for teachers, service personnel, and state troopers. (Partly because of the refusal of the Republican legislature to accept this, the question of PEIA, public employee health insurance, has been put on the backburner.) The governor and the House under pressure accepted the raise a few days ago, but the Republican-dominated senate finance committee blocked this today. At their late afternoon meeting, they stuck to their insistence on a 4 percent raise, which everybody knows will not be accepted by the strikers. The committee decision was seen by teachers as a slap in the face. In short, there’s no resolution to anything. The superintendents — whose influence over the course of the strike is extremely important since they decide ultimately whether schools are closed the next day — also continue to support the strikers. Likewise, the minority of Democratic politicians are generally seen by strikers as defending their pay demands. The union leadership remains lurking in the wings. It has lost much of whatever authority it had among strikers during the first days of the strike — but in the eyes of the state (and some teachers) it still stands as the “official” voice of the strike. If a debate over next steps breaks out, the question of who speaks for the strike will be posed sharply. As it stands now, there is a strongly established rhythm of complete school shutdowns across the state, plus protests of thousands all day inside the capitol. But there is little in the way of political speeches, deliberative assemblies, or mass meetings to discuss next steps for the strike, making it difficult for anybody, including the militant minority of radical teachers, to discuss demands or raise proposals for action. In so far as there’s organization from below, it largely has revolved around distributing information to parents and food to children across the state. The capitol protest is extremely lively and inspiring, but it mostly consists of chanting all day, plus a bit of meeting with and/or berating politicians. Strikers generally feel that this tactic has been working so far, and that victory is within reach. But the inability so far for the politicians to meet the strikers’ demands means that the whole situation is unstable. It seems virtually certain at this point that the strike will continue on Monday. It remains to be seen whether the strikers can develop forms of self-organization and mass action that would allow them to push for some sort of escalation sufficient to force the remaining right-wing politicians to concede.